How do I get started with Subscription Asset Manager (SAM)? WARNING: Subscription Asset Manage is reaching it's End of Life on October 31st, 2018. Installing SAM at this point still receives support until that date, but it is highly recommended to use an alternative method to manage your system subscriptions. Enhanced Reporting is a new feature available as of SAM 1.3, there are 2 options - fully supported (SAM integrated with Red Hat Satellite 5.6), or tech review (SAM stand-alone). Fully supported option: generating a cross-service report with Red Hat Satellite 5.6 and Subscription Asset Manager 1.3+. The Red Hat Satellite 5.6 server needs to be installed first before installing the SAM server - please stop here and refer to Satellite documentation for installation instructions for both. Tech preview option: used solely to generate reports on Subscription Asset Manager organizations - follow "Install SAM" section below then refer to Installing Packages for Enhanced Reporting. Install Red Hat Enterprise Linux 6.6, 64-bit architecture (x86_64). Subscribe using either Red Hat Subscription Management or Red Hat Network (RHN) Classic. Red Hat Subscription Management is recommended. If using Red Hat Network (RHN) Classic, add "SAM for RHEL Server (v. 6 64-bit x86_64) " channel sam-rhel-x86_64-server-6. See Viewing Subscriptions for the Organization for verifying subscriptions in the Organization. A new model of pricing and counting subscriptions were coincident with the Subscription Asset Manager 1.3 release. In addition, SAM 1.4 contains pricing changed in RHEL 7 release. SAM 1.4 (and updated Red Hat Subscription Manager) can properly parse and apply these updated subscriptions as well as the former subscription structure. Older versions of Subscription Asset Manager cannot. Install the configuration RPM and register system to the SAM server - see Registering a System. Refer to Managing Systems and Subscriptions for instructions to use System Groups, view installed Products for a System, attach and remove Subscriptions, configure and run auto-attach. Page 5 of the Red Hat document I have entitled "Red_Hat_Subscription_Asset_Manager-1.1-Installation_Guide-en-US" clearly states that the self-hosted SAM system must be a physical server. Is this still the case? This one limitation is preventing us from standing up a SAM server. Unfortunately, the requirement that the SAM server be a physical server is a non-starter for our organization. Thank you for your interest in Subscription Asset Manager. We'll investigate if we can waive a requirement for a physical server. You can run SAM on a virtual machine. I have entered https://bugzilla.redhat.com/show_bug.cgi?id=848118 to track this issue. We can officially run SAM on a VM, and will be supported if it breaks? I assume it will work fine on a VM, but I need to know it's supported. Installation of Subscription Asset Manager is done on a physical networked host. 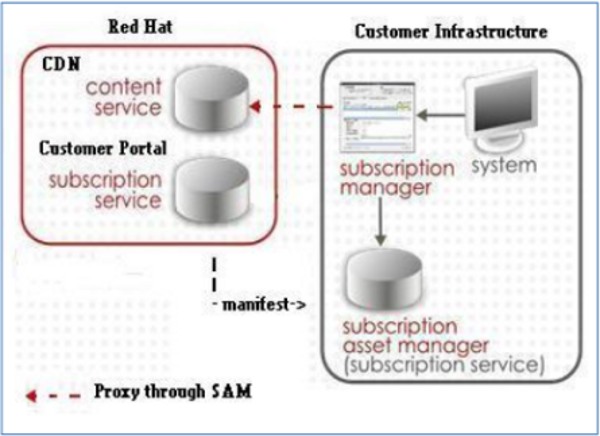 Subscription Asset Manager is included with a Red Hat subscription at no additional cost. You need to have a valid Red Hat Network (RHN) subscription, and be registered to RHSM to begin your installation of Subscription Asset Manager. You can use Subscription Asset Manager to manage subscriptions on both physical systems and virtual machines. Installation of Subscription Asset Manager can be done on a physical or virtual networked host. Do we know if installing and running SAM will allow us access to a RHEL YUM repository? We have a large VM Farm that we need to plug into a YUM repo for package management. We want our config management systems (chef/puppet) to be able to programmatically install packages. Hello, this will be part of Red Hat Satellite 6, which also provides content and system management whereas SAM only provides subscription management. Red Hat Satellite 6 is not yet generally available but you may be interested in taking a preview with the Managed Design Program - to learn more and/or sign up please visit http://red.ht/mdp. I am having issues with my manifest upload, how can I stop it and restart the upload? It is running for 2 days now. The TCP session initiation directions (i.e. for the 443 and 8088) need to be declared here so fw rules can be set. Could you please clarify what needs to be opened in the firewall for TCP port 443 and 8088! What is source and what is destination? Should the SAM server be able to talk to Red Hat over the Internet? Which addresses in that case? The SAM server can´t do that communication through the local Satellite server? Do you plan to launch the new version? The last which I have got is sam-1.4-20140512-rhel-6-x86_64.iso. And mabye version for RHEL7.